What Can My Dog Chew? When you go to the pets stores, there are dozens of choices for dog chews, some even claiming to help clean teeth. 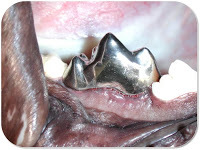 However there are choices which can be harmful to your dog’s teeth. We need to realize that our dog’s teeth are no stronger than our own teeth and their bite pressure is as much as two and a half times our own. So one may deduce that anything that could break our teeth, could break our pets’ teeth. Bones, hooves, antlers and hard plastic toys are all common culprits when broken teeth are noted. These teeth then need to be treated, often by root canal therapy or extraction. Therefore our basic rule of thumb for appropriate chews for dogs is “If you think it is too hard to chew yourself, it’s too hard for your dog to chew”. Toys and treats which are more appropriate are durable rubber toys like Kongs, rawhides, many dental chews and stuffed toys. It goes without saying that pets should always be monitored while chewing to assure they are not eating large pieces of a toy which may become stuck in the stomach or intestines. There are many dental chews and diets which are clinically proven to help keep the teeth clean. These products have the Veterinary Oral Health Council seal of approval and can be found at vohc.org. These products include Hill’s T/D, Greenies and Tartar Shield treats. These provide a healthy alternative to hard toys which may harm your pet. In conclusion, if you are looking for a treat to add to your dog’s regimen to keep his teeth clean, look for clinically proven choices found on vohc.org. By all means avoid anything which may harm your dog’s teeth. Remember, if it is too hard for you to chew, it’s too hard for your dog to chew.